So have you picked out that special Valentine's Day card for that special someone yet? If you have not (or if the one you picked out isn't all that special), I've got a tip for you. 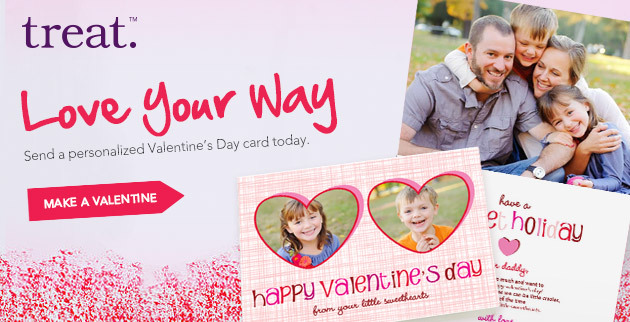 Visit Treat and make a personalized Valentine's Day card. Like now. 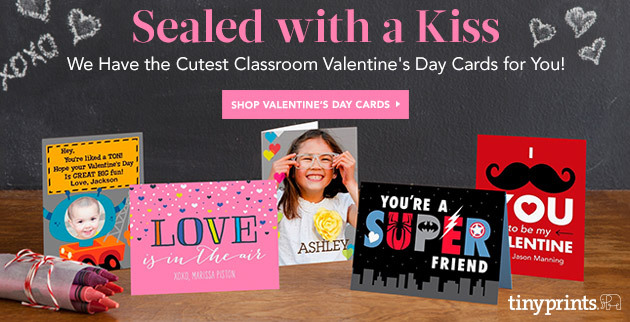 Also, if you need cards for your kids' classroom, check out their sister site, Tiny Prints, for the best classroom Valentines! If you do so by January 30 and use the promo code 20JANSW you can save 20% on your entire order! Classroom Valentines that reflect you! If you are not familiar with Tiny Prints, these are the best cards you can buy. And you can completely customize with your child's pictures, your own text, and text and fonts that you choose. If your kids are too young, too old, or non-existent, Tiny Prints also has great customized photo gifts and Valentine's Day party invitations, and their sister company, Treat has some aweome personalized greeeting cards. Here are the most popular cards. If you order by January 30, 2013 and use the promo code 20JANSW you can save 20% on your entire order! Don't forget to use the code 20JANSW to save 20% on your entire order!